This easily installable weir provides the tranquil sounds and visual splendor of a cascading waterfall - on a large scale. This is the way for do-it-yourselfers, and pond pros alike, to create an impressive, dramatic display of falling water, with professional results. Plus, it's easy to retrofit to existing ponds, and pond free systems, with flow rates up to 10,000 gallons per hour. 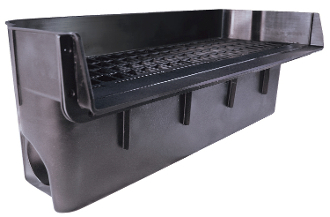 Includes 31 inch faceplate spillway, and a sturdy media grate for stones or potted plants.